I had a phenomenal day today! It was a tough 17km but the most picturesque stage of the entire race so far. Finally we were off the dusty road and spinifex grass! When we woke up this morning we were blessed with cloudy skies and a cool breeze. 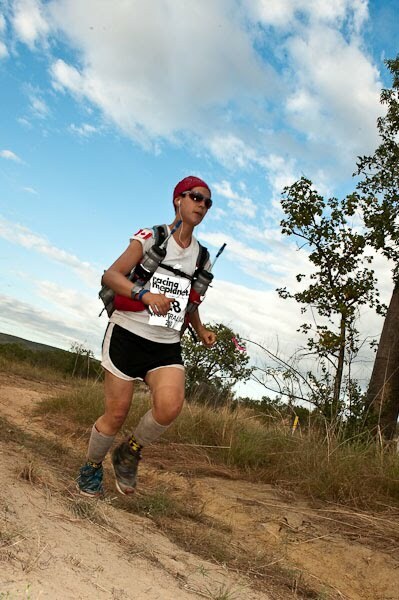 We ran out with energy across the air strip and into the bush… and that’s when the fun started! Lots of boulders – small and large – to navigate. We hiked onwards in single file again, but the field thinned out pretty quickly. It took so much concentration to keep one eye on the guy ahead and the other on the rocks below…One false step and it would be game over! To be honest, I had quite a number of falls again today. I even managed to do a little sommersault with my backpack on, which was rather interesting! Every time I went down I just kept thinking ‘head up, bum/hands down’… i can make it through this race with a bruised behind or even a sprained wrist, but not a head injury!! Thanks to my hyper-mobile ankles, I haven’t sprained anything yet (eep!) but I’ve done a number on my calf muscles with all that twisting and turning…. The terrain went straight uphill for a quite some time. The sweat poured down and dotted the coral rocks. It actually helped me figure out which path to take when scaling the boulders – follow the drips of sweat from the competitor in front!! Right hand up, left foot over, right knee down… it was a real exercise in scrambling. At one point I started overtaking some of the men – slipping and sliding over rocks and dirt the whole wway – and caught up to Lia! WHOA! All I could think was to savour the moment because who knows when it would happen again! A group of about 6 of us got into a pretty good pace and we called out the rocks, roots, and holes for one another…and more importantly, we picked each other up when one of us fell down. Which was often me. At one stage I hit my knee so hard that tears automatically came pouring down my face, but then my vision was blurred and it just caused me to trip again – twice! So enough of that, I thought, and I sorted myself out! After 6.6km of brutal terrain we came across Brandee, the lead doctor from the medical team, who must have been choppered in. She was there with additional water but I actually didn’t need any more. We were made to carry a full 3 litres of water from the start (so heavy!) and our group had made it there pretty quickly. After 10.2km we reached the first official checkpoint. We filled our bottles up from a stream and were advised that a deep water section was coming up – stick to the left if we wanted to keep our upper body dry. It was stunning – we were wading through a river gorge with sheer rock faces on either side blocking the sun. The mossy rocks were slippery, but we managed without any major injuries! The group of us decided to stick together to the finish, which was really nice. The terrain was just too dangerous to go much faster and we were enjoying one another’s company. We reached the finish line and set our sights on camp – GORGEOUS!!! We are sleeping right on the rock tonight – ticks and ants and all – but the moon tonight should give us an amazing view. I’m praying for cloud cover tomorrow. It will be a long day regardless, but just a little bit of a break in the weather should help…. There is a river gorge next to camp where we have to get our water. Mary came into camp by helicopter, but there isn’t much here. No shade, no bottled water… but laptops! Ha! It will be a swimming section right off the bat tomorrow morning and a tough 10km out of the maze…we have to carry all of our garbage with us out. And then a mere 90km afterwards with wet feet. I’m worried about swimming with my pack – will it float? Will I sink???? My shoes have started to come apart – the toes are almost gone – but I just have to get through one more hard day. The last day I could crawl through if I have to! I’m getting kicked off – love to all and keep the messages coming! think cool and fast thoughts!